Amazon was recently awarded a patent for a miniature unmanned aerial vehicle (UAV) that would be used for law enforcement and public safety. Designed for police officers, these body cameras may literally fly in future. Commonly known as a drone, the UAV can work as a mobile police dash cam or a body camera, and it can even be used to search for suspects and to trace a missing child. This smaller-than-a-shoulder body cam would record and use the information from all electronic devices, take the user's perspective into account and assess situational risks to offer aid for the police officers. According to Amazon, this wearable "assistant' would work as the eyes and ears for the user. Controllable by smartphone app, it would be easily voice commanded and be able to capture video and audio. Future versions may even be able to incorporate thermal imaging into the mix. As far as office safety is involved, the UAV can fly ahead and assess risks of potential dangers or attacks, aiding in effective situational awareness. The voice command will also call 911/dispatch and document the crime for police, should anything bad happen. Increasing use of drones for law enforcement is a reality, and therefore, a key topic for debate. Critics of the concept vehemently decry militarization of law enforcement, but tech experts and law enforcement agencies see immense potential in this. The harrowing attacks on officers in the past two years serve as a reminder that a tech upgrade might just be the tool we need to increase officer safety. Already known for both its stun guns and body cameras, Taser International Inc. is now exploring the concept of a drone armed with a stun gun. Still in the research and development phase, this could zap suspects flying in from the sky instead of officers waiting to get too close. In a terrorist situation, deploying a UAV Taser might be a boon. Officers can hope to incapacitate a threat faster and save lives without risking their own safety. The advanced drone would incorporate multiple functionalities of a stun gun, a camera and a light. This may be too revolutionary a concept for some people, but talks are underway for more options like these. For one, there are discussions for increasing the use of robots to eliminate risks and deploy lethal force. This will be a big help in extremely dangerous and high-risk situations like during the fateful incident in Dallas this summer. From a tactical perspective, most officers agree that these new technologies are useful tools. 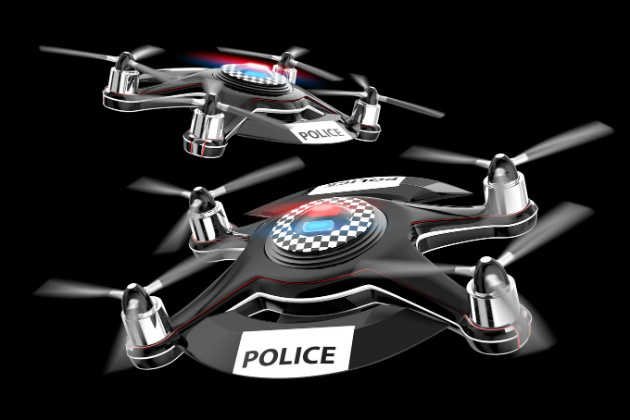 But detractors think this will blur the lines between the police and military — and in the current climate of mistrust with police, the advantages of the drones may be lost. In reality, though, emerging technologies like these may work very well to prevent deadly encounters and increase officer safety. Of course, they would need special training as remotely operating a piece of flying machinery while attempting to discharge a weapon might not be so easy. Talks are also underway to equip the first responders around the country with drones and train them to use the UAVs effectively. Earlier this month, Ohio officers got a glimpse of the drone technology as a part of the course to use this advanced technology for their work. Drones have generated a lot of demand — not just with the law enforcement, but also with firefighters and emergency personnel. These drones give first responders a bird's-eye view of hard-to-reach places and allow them to assess dangerous situations from a safe distance away.